Savannah VanOstrand of Evergreen with a three-pointer Thursday versus Swanton in NWOAL girls basketball. The Vikings downed the Bulldogs, 59-48. 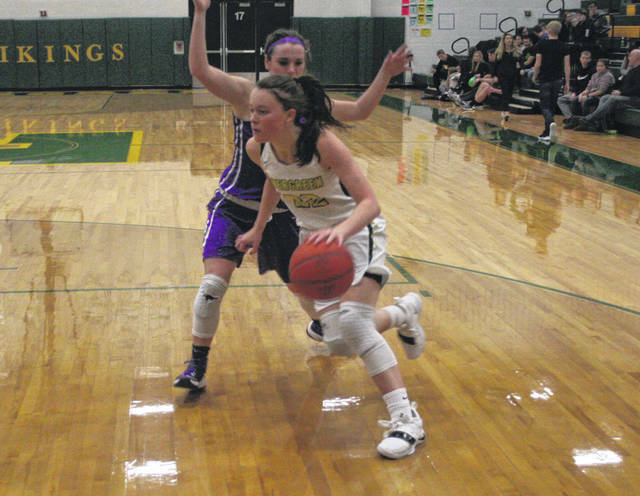 Abi Borojevich of Evergreen drives to the basket versus Swanton Thursday. 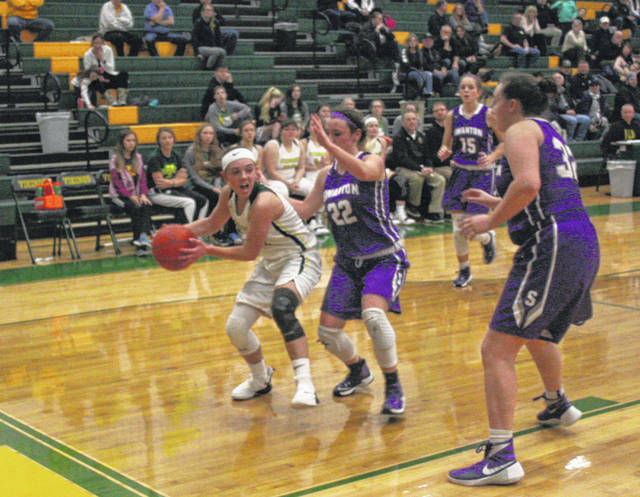 Mady Peluso of Evergreen looks for separation inside against the Swanton defense. Winning teams usually do not have one single focal point. 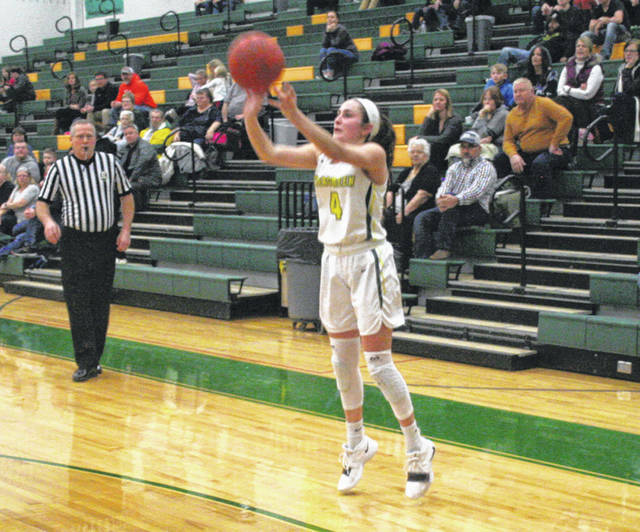 Evergreen got big second half shots from not one, but six different players, including five who tripled, to rally from a 10-point deficit to take down Swanton 59-48 Thursday at Evergreen in Northwest Ohio Athletic League girls basketball. Frankie Nelson’s two late first quarter hoops inside, one of the “it slipped out of my hands going up and came down through the rim” variety, gave Swanton a 9-8 lead before Mady Peluso’s baseline drive regained a 10-9 Evergreen advantage at the break. Averie Lutz put the Bulldogs back on the top with a triple at the 7:28 mark of the second and Swanton continued to add on from there. Kara Truckor scored in transition, Lutz hit another from long range and Grace Oakes scored on an offensive rebound to cap a 10-2 run, putting the Bulldogs up 19-12 halfway through the second. Peluso stuck one triple, and Kennedi Keifer came off the Viking bench and drilled another around an Oakes hoop to get Evergreen within 21-18. However, a 7-2 Bulldog flurry in the last minute led by Lutz’ fast-break layup and an Oakes triple from the way outside the three-point line boosted Swanton back up 28-20 at the half. A Lutz set shot 27 ticks into the third made it a double-digit lead but it was about that time the Vikings’ eight-player rotation began to wear on the Bulldogs. Swanton didn’t hit another field goal for over seven minutes and the Bulldogs were guilty of nine third quarter turnovers that led to a 14-2 Viking blast. Peluso and Keifer again hit from outside the arc to get Evergreen back to a 30-27 deficit. After Lutz got two for two from the line, Naomi Brand drilled another three-ball from the right wing, Abi Borojevich laced a floater in the key to knot the game at 32, and Kelsie Komisarek stuck a pull up jumper to give Evergreen a 34-32 lead with a minute left in the third. Nelson’s basket inside tied the score at the end of the quarter, but Borojevich gave the Vikes the lead for good with a right corner three-pointer at the 6:40 checkpoint of the fourth and then it was the Vikings turn to extend. Savannah VanOstrand became the fifth Viking to triple in the second half with six minutes to go to put the Vikings up four, 40-36. Peluso’s delay dribble drive score, and then a dish to VanOstrand for a layup made it 44-40 with 4:09 to go. The Vikings went delay and forced the Bulldogs to chase and foul. Borojevich and Keifer went four for four to increase the lead to 48-40. Evergreen had a chance to put the game away when VanOstrand went to the line for a pair after an intentional foul, and then Peluso for two on the ensuing possession, but could only cash 1 of 4 to give the Bulldogs a glimmer of life. Lutz triple with 1:48 left brought the Bulldogs back to 49-45 but the Vikings didn’t miss out on their next chances at the stripe. Keifer, Borojevich and Peluso went 8 for 10 down the stretch to put the game away. The upstart Vikings who were once 2-7, and picked in the second division in the pre-season NWOAL polls, now share the top spot with league favorite Delta. Lutz led all scorers with 21 but Peluso, Borojevich and Keifer countered that with 16, 15 and 13 respectively. Keifer’s output keyed a total of 16 Viking points off the bench. Evergreen hosts the NWOAL Goliath, 12-1 Panthers, this Thursday. Swanton also plays in the league that night, at home with Patrick Henry.